Want a taste of what's awaiting you in my premium lessons? Check out these videos. The free guitar lessons you will find in this section of GuitarLessons365 are the ones that you will find on my regular lesson channel on YouTube called ‘GuitarLessons365′. All of those YouTube lessons are organized much better here. Simply click on the category of the lessons you would like to watch in the sidebar to the left and you will find all of the YouTube lessons for that category on one page. In addition, all of the TABS that go along with all of my YouTube based free guitar lessons can be found on each lesson’s page in the form of a downloadable PDF link right above each lesson video. My goal with these free guitar lessons is to give any guitarist who can’t afford private lessons a chance to learn what really is required to be a competent guitarist, while also learning some fun stuff along the way. My YouTube lessons range from total beginner to extremely advanced in many styles so there should be something here for practically everyone. Keep checking back here weekly because I put up new YouTube lessons every week. By subscribing to the site you will receive my newsletter that I send out every couple of weeks letting you know what the new lessons are for the past couple of weeks and where to find them. If you have any questions about any of the lessons please ask it in the comment section that you will find under every lesson video on this site. I answer those a few times a day and it is the fastest way to get in touch with me most of the time. Well that is about it. Enjoy! GuitarLessons365.com provides FREE online video guitar lessons for players of all levels - beginner to advanced, acoustic or electric. To start learning just click a lesson category to the left to find ALL of the free lessons on the site organized by playing level and topic. Just dive right in and start learning. Most lessons also include a FREE TAB PDF for you to download. There are many 100's of free video guitar lessons in all levels of rock, blues, metal, country, classical and jazz. New free lessons are added daily. 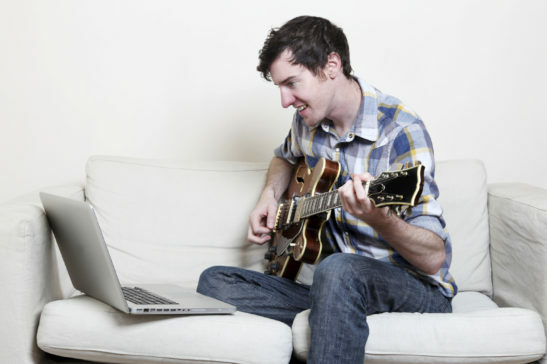 You will also find other categories dedicated to music theory, guitar tone and even backing tracks to accompany the regular free guitar lessons. What is the Premium Subscription? The Premium and Premium Plus subscription levels give you access to the GL365 Academy. It is within the GL365 Academy that you will find my complete systematic guitar courses covering many different styles and areas of music. Right now the Premium Subscription is just $9.95 for your first month, then $19.95 monthly after that. You can cancel any time. Or you can purchase a 3, 6 or 12 month subscription at a big discount with no re-billing. Just click the red Subscribe Now button above and you will be jammin' in just a couple of minutes! Do you have a free subscriber level? Yep we sure do. Getting a basic free subscription allows you access to all the free lessons on the site and the ability to leave questions in the comments section of every lesson on the site. It is important to become a part of the GL365 community. We are all here to help one another no matter what your subscription level. These Student Spotlight lessons allow me to answer you questions directly in order to help you learn quicker. Each of these lessons contains a video question from a GL365 student, along with a quick customized video response from me to help them with just about any guitar related question they have. These editorial videos will cover many different subjects related to learning the guitar and music in general. If there is a topic you would like for me to address that I haven't already, please feel free to contact me using the contact form at the top of every page on the site. I would love to hear your suggestions. These free beginner guitar lessons are designed to help you understand how to start learning the guitar in an easy to follow and systematic fashion. Simply choose a category below and start with the very first lesson in that category. As you progress down through the lessons in that category the lessons will get progressively more difficult. When you are first starting to learn the guitar it can be a very frustrating yet exciting time. The reason in can be frustrating is that if you have just started out you may be practicing quite a bit but still don't have the ability to play a basic song. This is true for every player so don't think it is just you. There are a few things you need to be able to do on the guitar before being able to put them together to pay a simple tune. But you will be rewarded immensely in the end. TRUST ME! I also think the first few months of playing can be very exciting. If you consistently practice you will notice improvement literally everyday. Seeing this improvement should help keep you motivated. Later on when you have developed a lot more proficiency on the guitar your progress will become much more gradual and over longer period of time so enjoy it while it lasts! I hope all of these free beginner guitar lessons will help get you started on your path as a guitar player. I have some nice beginner level song lessons available on the songs lessons page that I think would be a great place for you to go after you have mastered a couple chord and rhythm lessons on this page. After that the sky is the limit! Welcome to the wonderful world of the guitar! These free intermediate guitar lessons are for the player who has some playing experience and needs a thorough set of lessons to practice that can help to take their ability up to an advanced level. The great thing for intermediate guitar players is that there is now plenty of cool songs that they can play to challenge them and make playing the guitar everyday a lot more fun. I have a large amount of intermediate song lessons available for you to supplement what you are learning in these lessons below. Be sure to check those out as well. 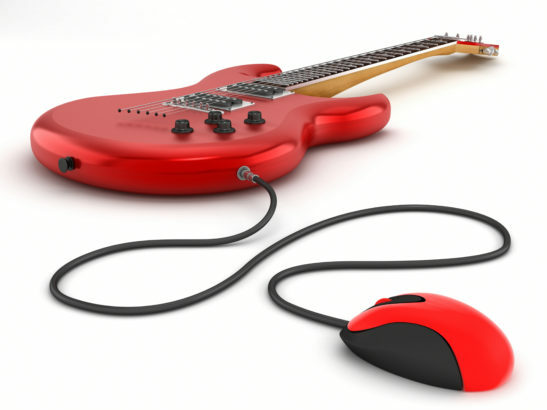 So if you have made it to this free intermediate guitar lessons page congratulations! It takes a lot of work to get this far but I hope you have had some fun along the way (and watched my lessons of course!). The chord and scale categories below are meant to be studied in sequence. Start with the first lesson and work your way down. All the other categories aren't really cataloged by difficulty level so feel free to just take a look at those lessons in any order you want. They are all very informative though! Tapping On One String "Etude"
These free advanced guitar lessons are designed to help you take your guitar technique and fretboard knowledge to the highest levels imaginable. Now I know that practically every guitar player on earth has their own opinion of what constitutes calling something advanced or not. Lets just say that I have put the lessons on this page that I feel the majority of guitar players would determine to be at an advanced level. However, even if you are an intermediate level player and just made your way to this page out of curiosity feel free to cruise through the lessons as well. Even though you might not be able to play all the exercises and techniques found in these lessons up to speed yet, practicing them at slow to moderate tempos can really make your guitar playing progress very quickly! The same thing goes for the advanced guitar players out there. Spend a lot of time practicing at a slow to moderate tempos in order to develop a clean technique. Speed is easy after you have developed proper form. Also, the chords, scales and scale visualization categories would actually be healthy for an intermediate level player to go through as long as they have gone through all the theory lessons on this site and the scale and chord studies found in the intermediate section. As an added bonus I have a lot of very advanced guitar songs of this site to challenge you even more. Ahh guitar tone.. It seems to be a favorite pastime for most guitar players to obsess about how to make their guitars, amps of FX pedals sounds better. I mean, have you guys seen a guitar magazine lately? They all seem to be nothing more than advertisements for the latest gear. Everyone is searching for some incredible guitar tone that they hear in their head but just can't seem to ever conjure into real life. These guitar tone tutorials are meant to help you along with this journey by demonstrating how to get some of the most cherished guitar tones ever created. I think the more of these guitar tone tutorials you watch the better you will be at designing your own specific guitar sounds. Studying how some of the greatest guitar tones ever heard were created can be a very inspiring and eye opening experience. Even if the tone isn't something that you would particularly want to use for your own playing, learning how different combinations of amps and FX affect each other can help you in your own tone searches. For all of these guitar tone tutorials I will be using an Amp/FX modeler. An Axe-FX II by Fractal Audio to be exact. Using this high quality modeler gives me access to countless amp and FX combinations to create unlimited guitar sounds. Many players have modelers like this or some combination of pedals and amps that they can use to recreate the guitar tones taught in these video tutorials. These free music theory lessons are designed to go along with all the scale and chord/chord progression lessons you can find on this site. You can simply go through them in the order you find them below or just pick something that you are interested in learning and go from there. Most of these free music theory lessons contain a free PDF download that contains the actual tutorial. The best thing to do is to simply print out the PDF files and read them each a few times to help the material sink in better. A lot of times you will be given a system to follow in order to help you internalize the theory concepts and you will basically need to practice those "mental gymnastics" until you know the material well enough that you hardly have to think about it at all. The main thing to remember with these lessons is that you want to be able to drop any methods you use to figure out the theory material because you are simply familiar enough with the material that you know everything without needing to figure it out anymore. What???? For example, in the "Understanding Keys" lesson below I will teach you a quick method that will enable you to figure out any major key in your head. That is great, but any method requires you to think a little bit. What the overall goal though is to eventually use the methods taught enough that you simply know the notes of say an A Major scale without needing to use a method to figure them out anymore. I liken it to the way many business men or women have a certain way of categorizing the names of people they have just met. If they hang around those new people enough they aren't gonna have to go through a little mental routine whenever they want to remember a person's name, they will simply know their name without thinking. That is what you are aiming for in these lessons. Hope this makes sense! Enjoy! All guitar players love licks. It is simply fun to take a cool little part from a solo that sticks out to you and try to figure out what it is. This Lick Of The Week guitar lesson series below is meant to be a fun way of perhaps inspiring you a little bit while possibly exposing you to a style or technique you might not be familiar with. I want the licks to be as versatile as possible so you will find licks on both electric and acoustic and from just about every conceivable style of music. If you find a lick that you think sounds cool try and add it to your own stockpile of licks that you throw out in your own solos. All guitar players have a certain stockpile of licks they like to fall back on so maybe some of these below will make it into yours. I encourage to take a lick you like and expand on it. Play it in other keys, different strings or whatever else you can think of to get all the musical use you can out of it. Also, if there is a lick that you would like for me to cover please let me know about it. I am doing a new one of these Lick Of The Week guitar lessons every week so I want to know what you guys want to see! Week No.1 "Randy Rhoads Style Legato Lick"
Week No.2 "SRV Style Open String Pentatonics Lick"
Week No.3 "Yngwie Malmsteen Style Diminished Lick"
Week No.4 "Kirk Hammett & Steve Vai Style Tapping Lick"
Week No.5 "Fast Cascading Country Guitar Lick"
Week No.6 "John Petrucci Fast Chromatic Scale Lick"
Week No.7 "Violin Style Volume Swells Lick"
Week No.8 "Hybrid Picking With Slurs Lick"
Week No.9 "Steve Vai Style Tapped 7th Arpeggios Lick"
Week No.10 "Fast Economy Picked Pentatonics Lick"
Week No.11 "Randy Rhoads Style Pentatonic Sequences Lick"
Week No.12 "Ritchie Blackmore Style Legato Lick"
Week No.13 "Nuno Bettencourt Style Tapping Lick"
Week No.14 "Randy Rhoads Style Diminished Arpeggios Lick"
Week No.15 "Slippery Slides With Large Interval Skips Lick"
Week No.16 "Legato Harmonics ala Van Halen & Joe Satriani Lick"
Week No.17 "Yngwie Malmsteen Style Pedal Tone Lick"
Week No.18 "Bluesy Hybrid Picked Madness Guitar Lick"
Week No.19 "Dimebag Darrell Style Two Handed Slides Lick"
Week No.20 "Zakk Wylde Style Repeating Guitar Lick"
Week No.21 "Joe Bonamassa Style Bending Tricks"
Week No.22 "Using Guitar Harmonics w/Fretted Notes Lick"
Week No.23 "Lindsey Buckingham Fingerstyle Lick"
Week No.24 "Eric Clapton Style Blues Lick"
Week No.25 "Fast Open String Pull-Offs Lick"
Week No.26 "Noeclassical Shred Lick ala Yngwie"
Week No.27 "Nuno Bettencourt Open String Hammer-ons Lick"
Week No.28 "Pentatonics w/Hybrid Picking and Slurs Lick"
My goal for these video guitar backing tracks is for you to be able to follow along with the audio track while being able to read the text on the screen that tells you what you are currently hearing and how to improvise over it. The text may tell you the specific key or chord you are currently improvising over allowing you to think less about the theory and more about where to find that specific scale or arpeggio you need on the guitar. I have had a lot of cool feedback about these video guitar backing tracks so I plan on doing many many more. Please let me know if there is a specific type of backing track you want to practice over and I will see if I can get it on this page. It could be a specific style, chord progression, key or all the above. I plan on adding one new backing track every week so keep checking back for some cool stuff to solo over. Remember, becoming a great improviser doesn't happen out of nowhere. It takes a lot of practice and is definitely soemthing you should be doing every day along with your regular technical studies or songs. The more styles you can improvise over confidently the more well rounded of a musician you will become. Be sure to check out every video guitar backing track I upload because you will definitely learn something by improvising many times over all of them. In this weekly guitar technique workout series I am going to try and give you a solid way of practicing various guitar techniques in an organized manner. When trying to learn to master all the various techniques one can do on the guitar it can be quite confusing and frustrating trying to figure out how to practice them all. So what this weekly guitar technique workout will provide you is a steady progression of lessons that encompass pretty much every technique imaginable on the guitar. The idea is to take each weekly guitar technique workout and eventually practice them together back to back everyday during your practice sessions. The focus with this kind of technique study is not only on proper technique, but also on endurance. The first few workouts will be more basic but also make a great warmup for more advanced guitar players. As I add more weekly guitar technique workouts they will become more challenging and encompass and enormous amount of guitar techniques. But hopefully, you can start combining all of these individual weekly guitar workouts into one large guitar technique workout that you can play through everyday or at least a few times a week. This is a big undertaking on my part, but if you meet me half way and study the weekly guitar technique workouts thoroughly I think just about anyone will become a more well rounded player with great stamina.